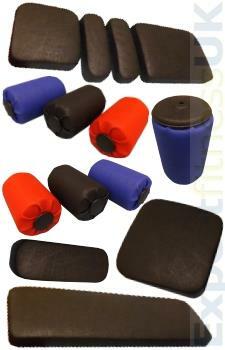 Our Ready Made Gym Upholstery Pads are a Universal Fit and available in various shapes and sizes. During manufacture we use thick Plywood or Hardwood and industry standard Reconstituted Foam for years of use. The gym pad is then covered with one of our many colour Upholstery Vinyls specially formulated for the fitness and medical industry and finally backed in a Backing Cloth Fabric for that finishing touch.